HELP! Instant fan, so what next??? Discussion in 'Ontario Knife Company' started by J.Davey, Feb 21, 2019. Okay, so I just received an SP10 a few days ago and I LOVE IT! But now I want MORE!!! I have 3 in my Amazon cart, but can only buy one (I'm poor). I CAN'T DECIDE! It's between the SP5, SP53, or Kukri. I'm a huge Bowie fan (it's the quintessential American Knife), so the SP5 seems like the logical choice, but I already own a few. I don't have a kukri in my collection (which is mostly large fixed blades and choppers already, just not a kuk). And I just kinda' dig the SP53, and it seems the Spec Plus Gen 2 series is going bye-bye, so time is a factor there. Since you're here, any opinions on the SpecPlus Alpha Combat? I've always liked upswept blades. Thanks for any help with my indecision! buckfynn and Beastchopper like this. Get what you want. But the SP-53 is a literal king of the choppers. The newer SP-5s don't got a sharpened swedge for people on "EVIL DAGGER!" States, but it can be sharpened easy. Since the SP-53 is going away I suggest that one. When the SP-51 was going away I put off some other purchases to get enough to cover a life time. And when they went...then were every where one day and totally gone the next. The SP-53 is one of the best all round choppers and loppers. The SP-5 came back from being "Sun Setted" its a good "light weight" general purpose blade that is good for general carry as its "lighter" than the SP-53. The Kurkri is a good american style version of it. If I had a choice I'd get the SP-53 first. Meshach and Beastchopper like this. I just recently got the sp53, idk it's going away??? buckfynn and AndreLinoge like this. Of the three, the sp53 is the only one made with 5160, a near perfect large blade chopper steel as done by Ontario. You’ll be surprised at how well the sp53 performs, ntm it’s ease of sharpening. Meshach, Beastchopper and Crag the Brewer like this. Could score an RTAK for 70 bones on Ebay... I was not disappointed. Did you buy one already? It goes on sale for a few bucks less once a month on a non sponsor (but very reliable) website. I highly recommend the rtak2, great for batoning hardwoods and for chopping through undergrowth in mixed forests. Can get a kydex sheath super cheap on bay, then modify/add strap—and lock for upside down carry across the back. Beastchopper and AndreLinoge like this. Yep. The same seller still offers auctions starting quite low, had mine since last August or so. The RTAKII is a damn good value all the way up to the hundred dollar mark, I think. 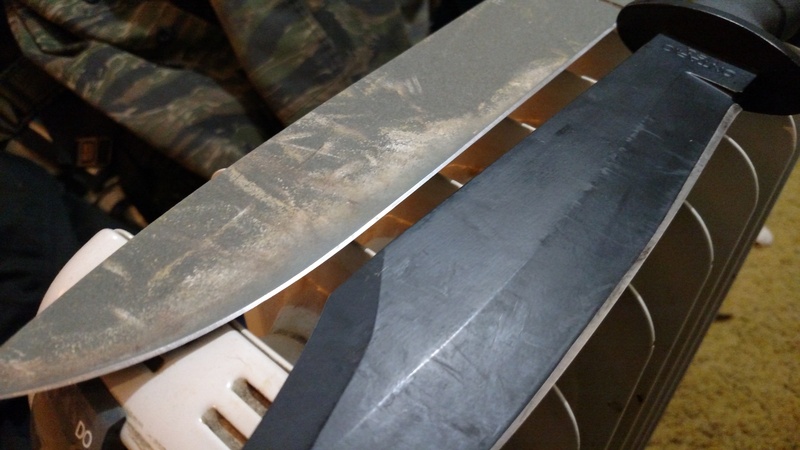 Nicely shaped, full flat grind on a big ol chunk of 5160.. the coating is rough as a cob, but it smooths out with enough chopping, or you can strip it off. The handles are chunky and block ish, but that is fine for me. I have the curse of long hands, so it works great for me, but if you got a big ol meatball hand, then you might want to sand it down to some sort of contour. Plenty of room for that on the factory handle slabs, and plenty of aftermarket choices if you dont feel so adventurous. The sheath is passable, a knife this size isn't something you'd be wearing on your belt for long periods, but it works fine and will keep your pack safe from the edge while you carry it like that. I will say, the RTAKII is no comparison to an Ontario machete for clearing brush, though. Chopping the odd limb or scrub, fine.. Removing Multifloral rose, better grab the machete. Or welding leathers. Or both. Meshach, Yonose and Beastchopper like this. This.. this is an excellent idea. I keep bumping back my Cerberus purchase because I keep finding good stuff in the maker's market here... I should snag one before they can the design. What does that website rhyme with? Kidway USA. Okc’s and Cold steel’s seem to alternately have a huge selection on sale. 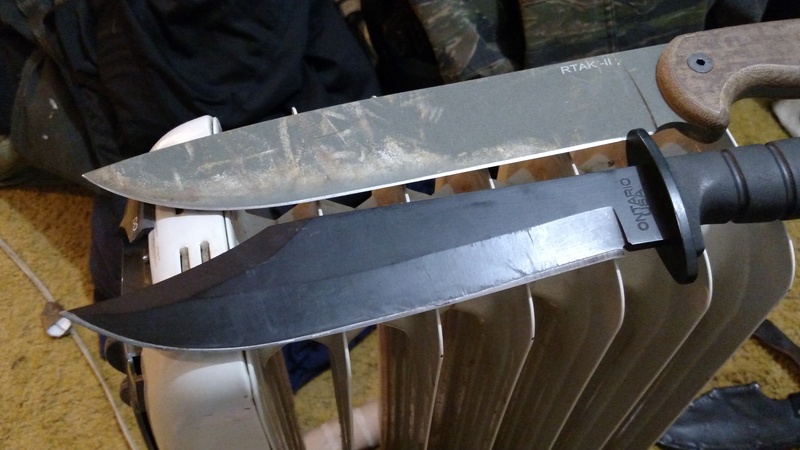 I will say, the RTAKII is no comparison to an Ontario machete for clearing brush, though. Choppingr the odd limb or scrub, fine.. Removing Multifloral rose, better grab the machete. Or welding leathers. Or both. The rtak2’s lower weight make it better than the sp10 at what it does. It won’t chop a tree as quickly but after a 14 hour hike I think the rtak2 would make a better weapon against the sp-10 simply because of its lighter weight. I honestly believe the rtak2 is a more versatile blade, yet the coolness factor of the sp-10 keep sales as high or higher. I was guilty of this myself, buying 2 sp-10’s before buying my first rtak2. Ontario has one of the most eclectic collections of different blade styles,(with an equally interesting accompanying history) and I wouldn’t mind owning one of each. Sp 53, everyone should own at least one. I was fortunate enough to score a 52 recently and i must say i like it better for everything except battoning (which i only baton small pieces anyway). But since those are hard to come by buy 2 53’s! Crag the Brewer likes this. I'll add that I love my sp5s. 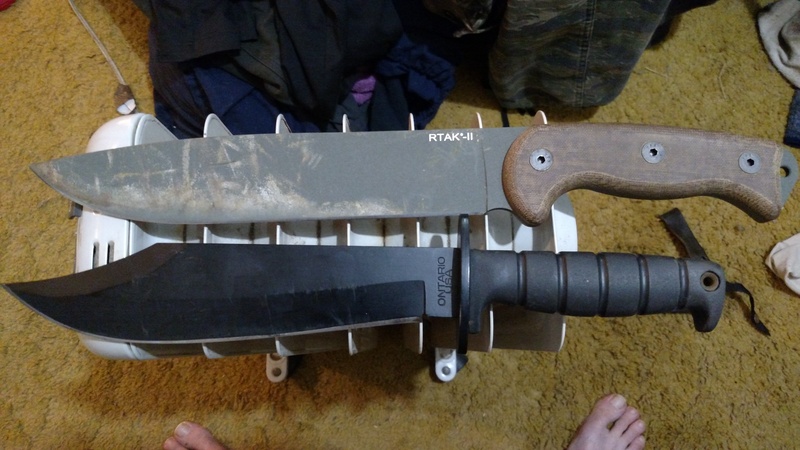 I have two in the vehicles and they make great camp knives to beat on wood with. I have 2 in 1095 and 1 in 1075. I had a sp10 at one point and it was cool, but I like the sp5 better.